Q: How was the show that we see today shaped by the particular cast of characters at Tamiment that summer? Barer: We cast a funny girl in the ensemble as the Princess, and the producer was furious. He said, ""You can't do that to me - I have a top banana, and I pay her $500 a season! My top banana has to be the princess or we'll have an insurrection!"" Our solution was to limit the part of Winnifred to 12 lines of dialogue and give the Queen the longest part ever written. At that point, Winnifred didn't even have a song. Rodgers: The comedian playing the King claimed to be a terrific mime, but we knew he couldn't sing. We thought, ""Wonderful - we'll keep him quiet all night."" Thompson: We had another young woman with an absolutely gorgeous voice, but she was gawky and couldn't move well. So we put her in a stunning costume, slammed her up in a big gold cage, and made her the Nightingale of Samarkand. Rodgers: All those things ended up working for us. It makes perfect sense, when you think about it, because it's easier to write when you know the performers you're writing for. Q: At that point, did you expect the show to move to New York? Barer: No, we were aiming for the tube. Rodgers: Those were the days when there were a lot of hour-long musicals on television, but nobody who came up to see it was interested. Then the designers Jean and Bill Eckart met with us and said, ""Do you think you could expand this into a full evening?"" We said, ""Sure!"" on the theory that you just say yes and then figure out how to do it. The Eckarts got George Abbott interested. He was in his 70s by then, but still a very popular director. Barer: Mr. Abbott liked it, but thought it was ""precious."" Jay and I sat in a room for a long time trying to figure out what he meant by that and how we were going to get it out. Finally, I said to Jean [Eckart], ""Maybe we have to give Mr. Abbott up. There are other directors out there, prize winners, some of them precious themselves!"" Jean said, ""Not on your pea pod - we're going to have Abbott."" Fuller: I was brought in to take some of the feyness out and refashion the second act so that it would work as a full evening. I knew exactly what Mr. Abbott was talking about. I added the subplot of Lady Larken and Sir Harry, but I have to emphasize that the big, wonderful ideas in the show were originated at Tamiment. The finale of the first act was already there, and it's fabulous. Marshall wrote some of the best lyrics you're ever going to hear for this show. Q: Ms. Rodgers, did you feel any extra pressure as the daughter of Richard Rodgers, one of the theatre's most celebrated composers? Rodgers: Oh, none! (She laughs.) That had been hanging around my neck for years. I was just thrilled to have the chance to write music, and the show created a fair amount of excitement. It was as if Richard Rodgers' daughter was the dog that plays chess. Never mind if he can win - it's amazing that he can play at all. My father adored the show. 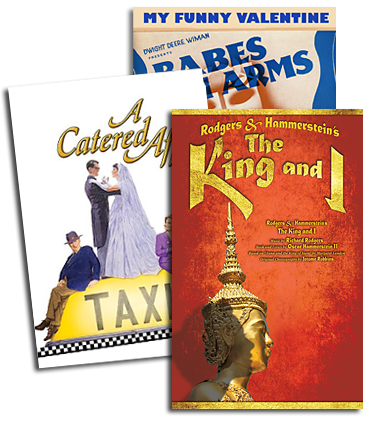 Q: By its 35th anniversary, Once Upon a Mattress had been produced 20,000 times and it remains one of the most popular titles in The R&H Theatre Library. How do you explain its lasting appeal? Rodgers: One reason is because there are nine principal parts. Kids love to have nine big parts that they can play. And it's innocent. It's fun for the sake of fun. Barer: Six of the nine principals are male, and the ladies who run the drama departments are always looking for something with a lot of male parts. The only way to get boys out to audition is if they can play principals. Also - it just suits! People like the sauciness of it. Thompson: We knew at Tamiment that if we were going to get this show on in three weeks, we had to write something that would be fun for the actors. If they approached it as a chore, we'd never get it done. I have seen hundreds of productions in the last 37 years, and people always tell me that it's so much fun to do. One young woman came up to me and said, ""My daughter is playing Winnifred in school this year. I played it when I was in school, and my mother played it when it was first released."" Three generations. Fuller: The joke about this show is that no one's seen it, but everyone's been in it. Thompson: Sarah Jessica Parker came up to me on the first day of rehearsal [for the new Broadway production] and said, ""I want to thank you for writing this show."" And I said, ""I want to thank you for being in it."" And she said, ""No, I really want to thank you, because my mother and father met in an amateur production of Once Upon a Mattress. If you hadn't written it, I wouldn't be here."" I thought that was so charming. Hark ye, Theatre Library customers! Present Once Upon a Mattress any time from September 1, 1997 to September 1, 1998 and we will waive all royalties for your opening night. Book immediately to avoid possible future restrictions. For further information call The R&H Theatre Library at (212) 564-4000, or fax us at (212) 268-1245."